One month later, giving birth to Cliff feels so far behind me yet remains one of the most visceral and deeply moving experiences of my life. It is truly a gift to play the role of a mother bringing the life she nurtured for 9 long/fleeting months into the world, and I am beyond grateful to have been both a witness and protagonist in one of life's most incredible natural processes. He came impeccably timed and a week early, which I had felt he would do for some time. I was 1cm dilated at my 36 week appointment and 2.5cm two weeks later. Although that’s not at all a tell-tale sign, our doctor said “If I was placing an office bet on you, I’d say you'll go early.” When I was a week and change from my due date, I felt strongly that he was coming soon. Things starting to shift in my body and I felt almost outside of myself sometimes. Maybe it was nerves—but if so, they all dissipated as the real thing started around 6pm on Wednesday, April 22nd. 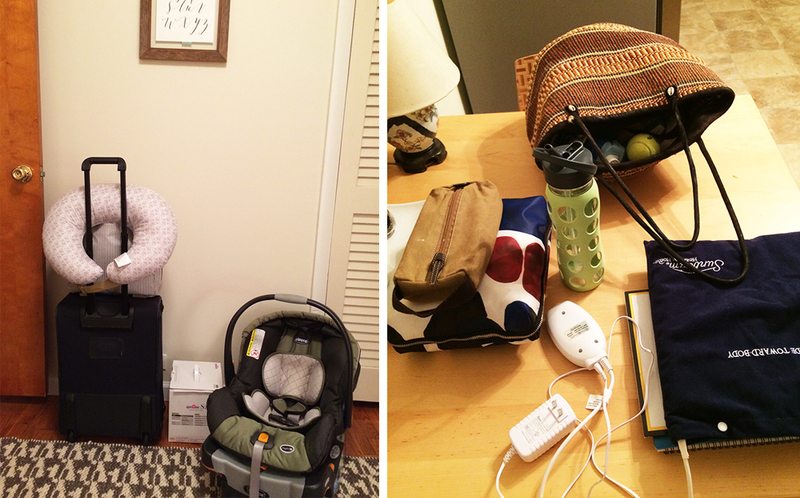 I was exactly 39 weeks pregnant and still not 100% confident that this was really it (how could any new mom be? ); I just started noticing some uncomfortable menstrual-like cramps low in my abdomen. Luke was at an athletics banquet that evening, so I was by myself at home. It was earth day and I felt guilty because I had been inside literally all day long, hustle-bustling and trying to tie up loose ends before Cliff came. I’ll be honest, prior to that week, I hadn’t even packed my hospital bag! I looked out the window and saw the sun was going down, so I decided to take a walk. Our home backs up to Indiana Wesleyan University’s campus and I ended up on the practice soccer fields for the next hour or so. I paced, prayed, and sang—three songs in particular, over and over: our song for Cliff, Little Blue by Josh Garrels, The House of God Forever by Jon Foreman, and God I Look to You by Bethel Music. It felt good to walk and be outside. I could tell that things were slowly building, but tried to push it out of my mind since I’d been taught it’s best to completely ignore early labor so as not to “use up my resources" too soon. After my time outside, I knew I should try to keep myself hydrated and nourished so I had a snack of steamed beets—one of my weirder late pregnancy cravings. When Luke got home around 9pm I told him how I was feeling, but again, we tried not to get ahead of ourselves. The car was packed and we were ready to go. We even had my routine 39 week check up the next day at 1:30pm, so we knew we’d be making the hour drive up to our doctor’s office—which happened to be right next to our hospital—anyway. I texted our doula, Candice, to tell her how I was feeling and she urged me to go to bed early and get as much rest as I could. Sleep was very iffy that night. My contractions became strong enough that I had to practice breathing through them as I was in and out of sleep. I would breathe very deeply/slowly in through my nose and out through my mouth as they came and went, physically willing myself to relax, and then I’d doze off again until the next one. In my half-sleep stupor, I found I was repeating phrases from a collection of birth affirmation notecards Candice had made for me. Statements like “I relax and let my birth happen” and “rhythm, ritual, relaxation”. I didn’t know I had committed any of these to memory, but it was kind of cool how they ran through my mind as very early labor built. I got up to use the bathroom a minimum of 6 times that night. I’ve already forgotten how difficult it became late in pregnancy to hoist myself out of bed and hobble down the hall in the middle of the night! I felt like I was 95 years old. We woke up the next morning and lingered in bed for a little while. I told Luke about my all-night contractions, and at that point, I began timing them with the iPhone app Full Term (they were very irregular and no more than 40 seconds long). Again, we tried not to get overly excited. At this point my contractions weren’t exactly ignorable, but I was able to continue getting some little things done around the house and packing last minute items between contractions. I took a long shower, shaved my legs, did my hair, drank tons of water and tried to eat as much as I could to keep my energy levels high. I even took a nap. Anything that was relaxing or helped pass the time. When a contraction hit, I would stop what I was doing and use vocalization to get through it—basically low, deep moans, for lack of a better word. I used this kind of vocalization liberally throughout my entire labor. It may have been the single most effective technique to help me let go and open up to what was happening in my body. Luke decided to assemble our new bed for the guest room to keep himself busy, and he now says that it was the best thing to have a project to work on while I was laboring without necessarily needing him. He told me it was kind of funny to hear me work through a tough contraction in the other room and then pop in to the guest room and cheerfully ask him “how’s it going? !” when it was over. Before long it was 12:30pm and we could leave for our doctor’s office, which, although an hour away, was located right on campus at the hospital. 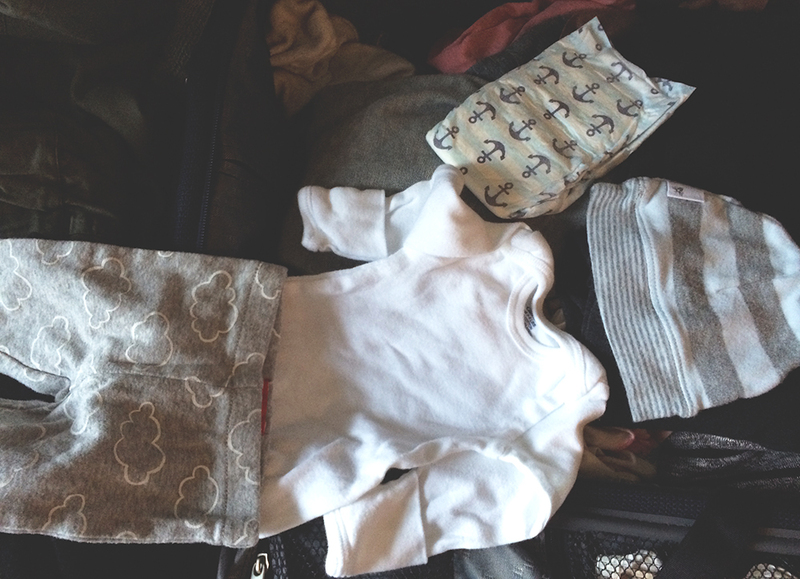 We tried to anticipate the best possible outcome—hopefully this was true labor and Cliff would be born that day. We were determined not to drive back home again before he came, so there was a reality of having to kill a lot of time and potentially even get a hotel for the night, but we hoped for the best. Luke reminded me that it was totally out of our control and we’d deal with things as they came. The car ride was definitely uncomfortable, but not unbearable. I had a portable heating pad that I plugged into our cigarette lighter and used on my lower back, where I began to feel some dull, achey contractions which were a bit less intense. I’m guessing back labor started because Cliff’s position had shifted when I sat down. It didn’t last beyond the car ride. I remember feeling like ANY kind of movement in the car was such a task—I felt glued to my seat. I ate one final snack, a packet of Trader Joe’s Trek Mix, and it didn’t sit very well. Still, I’m really glad I continued to eat for as long as I could throughout labor as I think it helped quite a bit with stamina. My contractions were averaging 35-50 seconds each and none were longer than one minute. They were still irregular but around 4 minutes apart. We arrived at the Fertility & Midwifery Care Center for our appointment with our midwife, Lindsay, who would be delivering Cliff. I felt a bit like a spectacle as I had several contractions on the way in to the building and then one in the restroom. They were building in intensity and I’m pretty sure I was making a bigger scene than I realized with my ever-increasing level of vocalization :) While I was in the restroom, Luke checked us in and told them we thought I was in labor. When I walked into the waiting room I caught lots of excited glances from the nurses and staff. It was very sweet. We were sent right back to see Lindsay. We knew that whatever we were about to find out in the exam room would dictate how the rest of the the labor played out. The unknown was making me feel nervous and I remember my whole body trembling. In the room, I could do very little to help Luke take off my shoes and leggings so Lindsay could check me. By now we were going on weeks (months?) of my husband sweetly helping me put on/take off shoes and socks—awww. Lindsay came in and we described what the morning had been like. She said “Alright, let’s see what’s going on!” I had my eyes closed, but later Luke told me the look on her face was priceless as she announced “Um, holy moly. Yep, you’re definitely in labor!” and told us I was 5-6cm dilated! I started crying with relief. Lindsay told us that we could go ahead and check in to the hospital. There were actually two hospitals within a half mile of the office, and although we had chosen one already, Lindsay asked us if we would consider switching at the last minute because she had another patient in labor there and it would be easier to have us both in the same place. Although this seems like a pretty big last minute change, it didn’t really bother us at all—we knew that both hospitals were great options so we gladly obliged and off we went. I texted Candice and she said she was on her way. When we entered, much to my chagrin and Luke’s amusement, there was a gentleman waiting for me with a wheelchair, per hospital protocol. Luckily, we were able to skip triage and check right into our labor and delivery room, which was spacious and calming with lots of natural light and a whirlpool tub in the bathroom. We began to settle in and get acquainted with our nurses and Candice arrived shortly thereafter. It was probably around 2:15pm. I had tested positive for Group B strep which meant I needed to have 15 minutes of antibiotics administered through an IV, so a nurse began her first of FOUR (!) attempts at getting my IV in place. No joke, that might have been the most stressful part of my whole labor. We were basically barraged with questions, which was somewhat annoying, especially when a nurse essentially asked me “On a scale of 1 to 10, how much pain would you like to experience today?” I know they were trying gauge whether or not I would be asking for drugs, but the way she phrased it was just so bad. I had no idea how to answer! I ended up telling her 9 since I was hoping to not have any kind of pain meds or interventions unless medically necessary. I had actually typed up a short birth plan, but I forgot to retrieve it from my printer before we left home. Oops. IV and interrogations aside, the nurses were actually very good and supportive of the kind of birth experience we hoped to have. I really appreciated that they never offered medication and willingly followed me around the room in order to intermittently use a handheld heart monitor to make sure Cliff’s heart rate was normal (instead of using the strap around my belly and confining me to one spot). After the nurses finished their initial routine monitoring, the room was calm and peaceful. They checked in from time to time over the next hour or two, but for the most part it was just Luke, Candice and I. We didn’t talk much and I remember wondering if they felt bored! 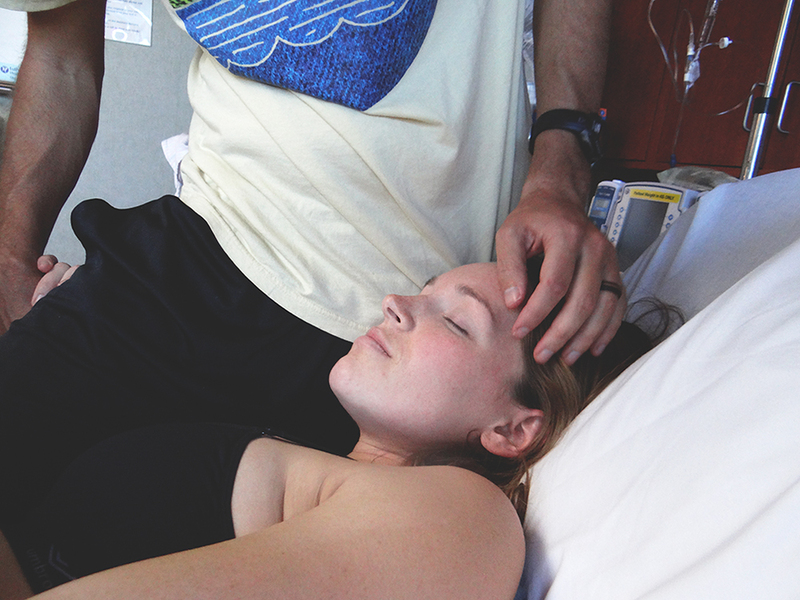 When a contraction hit, often I’d hold onto Luke while Candice applied counter pressure to my lower back. In the background we had an early labor playlist going which I’d compiled a few days earlier—songs that were fun and calm but still slightly upbeat. Later on, when things started getting really intense, we turned on an active labor playlist I had also compiled with some of my favorite soothing, sentimental tunes. I am so glad I took the time to do this—there were several songs I had a highly emotional response to during labor, which I’m sure helped me to relax, let go and really go inside of myself for some of the more difficult contractions. I found myself singing along with some and crying with others. One of these was the Lumineers “Ho Hey”, which I’ve always liked, but has never made me cry! It was the chorus that really got me (“I belong with you, you belong with me, you’re my sweetheart”) as I thought about our little guy who would be with us so very soon. I’d learned that crying during labor can be a tool, so I consciously tried let go of inhibition while assuring Luke and Candice that I was fine. Later on, I remember Luke and I looking at each other and smiling and singing along when our song for Cliff, Little Blue, started playing. Lastly, I remember a song by Colin Hay, Waiting For My Real Life to Begin, seeming particularly sweet and touching in the moment (“any minute now, my ship is coming in, I keep checking the horizon…”). 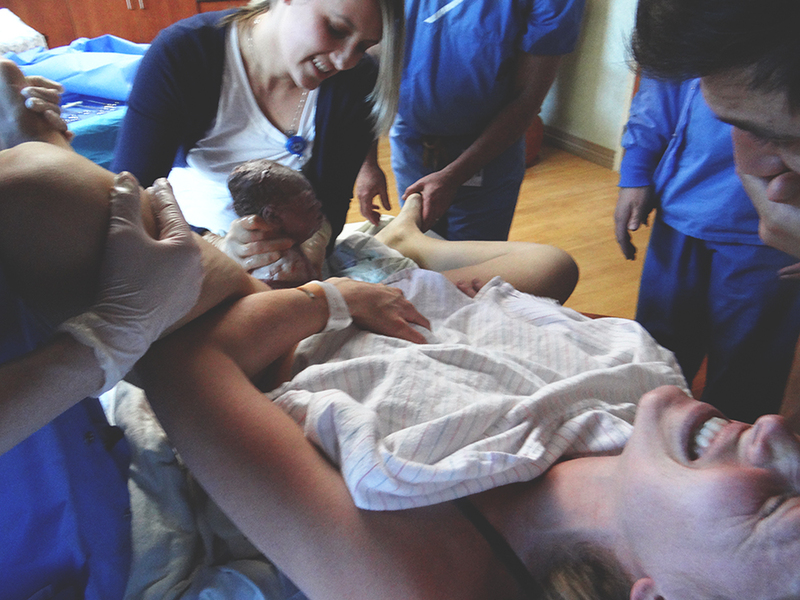 I treasure these moments during my labor and really, really enjoyed having a specific birth playlist. I had anticipated using the whirlpool tub all throughout my pregnancy, and after a couple hours of laboring on the birthing ball and walking/swaying around the room I decided to try it out. I experienced my final moments of any kind of inhibition as I took off all my clothes except for my black sports bra in front of the nurses and Candice. After that, it was no holds barred ;) Before getting in I decided to get checked by a nurse, who said I was “a good 7.” I was glad to still be progressing. I got into the tub and expected it to feel comfortable and soothing; but almost immediately my contractions intensified and it became difficult to find a position that worked for me. I ended up on my knees bent over the back of the tub, Luke holding me whenever contractions hit, and Candice massaged my lower back. Her hands were ICE COLD and it felt amazing! Hilariously, in my head I was convinced she was dipping her hands in ice water before she touched me each time. Obviously, that’s not what she was doing, but when I mentioned it she laughed and said her clients have been known to say of her, “cold hands, warm heart”! Either way, the cold felt wonderful as I knelt in the warm tub in the darkened bathroom. Candice had turned off the lights, so it was very peaceful, with the only light coming from the windows. After 45 minutes or so, I started to feel cold in the tub and decided to get out. Before my feet hit the floor Candice/Luke/the nurses were wrapping me in blankets. Once I was out things started getting extremely intense. I was beginning to moan louder and deeper during each wave of pain; it was very primal. During a particularly hard contraction, Luke and Candice came along either side of me and held me as I bore down into a squat. Candice pointed out that I had naturally squatted and asked if I felt like pushing. I told her that I did feel a bit of an inclination so she said I should give in to the sensation, but only gently for now. At that moment it dawned on me that pushing would help the baby move down. Seems blatantly obvious, right? But it was actually really nice to have this realization before it was time to really, really push. I started pushing a little with each contraction and imagined him moving down lower and lower. Around that time Lindsay entered the room along with our doctor, who was also attending, and I felt so happy they were there! Luke said I visibly lifted at the sight of them as though I realized that meant we were really getting close. Candice mentioned to our doctor that I had started to feel like pushing, so we decided to have him check me. He’s a very laid back guy and seemed so casual when he said “Alright, game time! You can start trying to push whenever you want." He was so calm about it, which was amazing—it kept me from feeling overwhelmed by the prospect of pushing, which was the stage I’d definitely had the most fear and reservation about. At one point I recalled that changing positions helps the baby move through the birth canal more easily, so I decided to lay down and push on my side. The only problem was that every time I had a contraction and pushed, my body wanted to curl up into the fetal position and I would almost fall off the edge of the bed! I didn’t realize it was happening because Luke was right there keeping me from rolling off, but everyone seemed very concerned and moved me back towards the middle several times. Things were getting increasingly more vocal now as everyone cheered me on with every push. 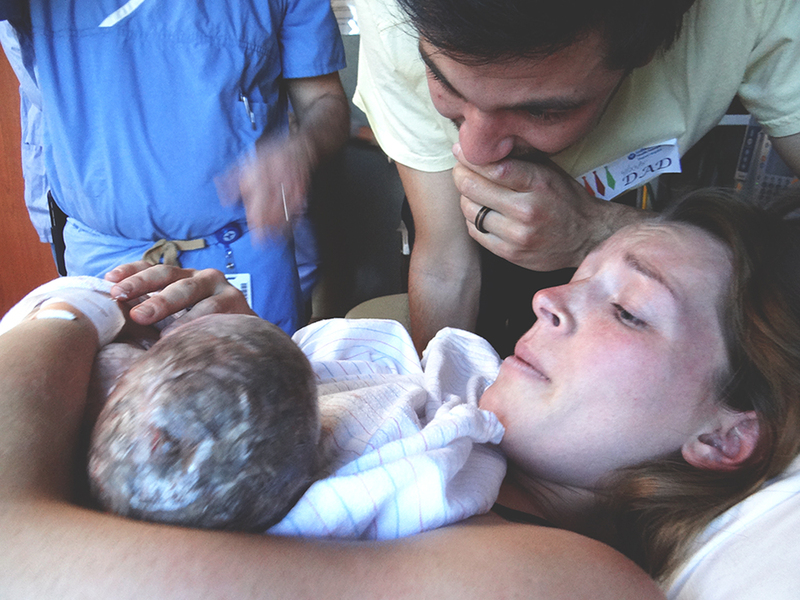 Our sweet midwife was cheerful and calm as she watched his head begin to slowly appear. Our wonderful doctor stood by and let me squeeze the life out of his hand after I accidentally grabbed it thinking it was Luke’s (let’s be honest—at that point I didn’t care who or what I was grabbing onto), and he even manned our camera at one point! BEST doctor ever. Despite the fact that I was working through an incredible level of pain, the moments in between my contractions/pushes were incredibly peaceful and gave me a much needed opportunity to rest before the next wave came. We were getting so very close now. I was pushing and roaring with each contraction. I was very conscious of my screaming, but I wasn’t embarrassed of it. The screaming was not for panic, fear or feeling out of control—it was a natural outcome of the exertion my body was under. The levels of excitement and anticipation (and, obviously, pain) were rising. I knew that soon I would have to put every ounce of strength I had into pushing, but for now Candice reminded me to let things happen slowly and steadily and allow all the tissues to stretch at their own pace to minimize the risk of tearing. It was a relief to know I didn’t have to push my brains out every single time. Pushing was definitely tough, but my team was incredible in guiding and encouraging me throughout it. Before I knew it, they were telling me that Cliff’s head was visible—and he had a mound of dark hair! Thus began the longest, hardest part of this crazy experience. He had descended to where his head was RIGHT THERE, and all I had to do was push it out. There is no more fitting time to use the phrase “so close, but so far away”. He was so close to being born that everyone was convinced that the next push would be the one that delivered his head. They were trying to encourage me by saying “This is it! His head is going to come out with the next push!” and, unfortunately, I felt like that happened over and over. It was like I was running a race and all the onlookers were telling me "The finish line is right around the corner!" but, when I rounded the bend, there was still a long stretch ahead of me. I started to feel defeated and even believe that I might not physically have what it takes. 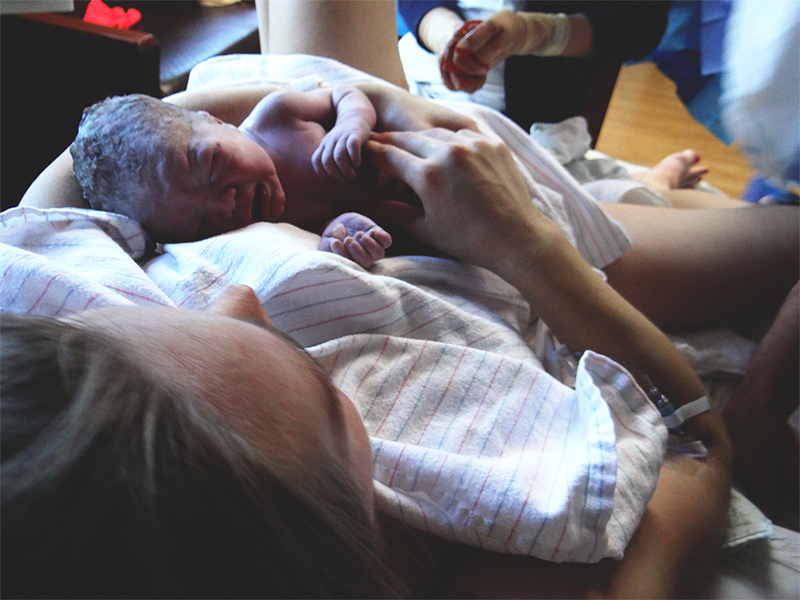 Every contraction, every push that he didn’t come out I felt more like a failure. I didn’t like that the nurses were getting louder, trying to cheer me on but instead just making me feel chaotic. Thankfully Luke, Candice, and our doctor and midwife intuited that I was starting to deflate and kept the words of encouragement coming—things like “you’re amazing, you’re doing it, he’s going to be in your arms soon.” At one point someone told me to look down and see my baby, but all that was visible was the tiny crown of his head, which looked like a midget head! In my somewhat out-of-mind-and-body state, some of the fears I’d had during pregnancy came rushing back that he didn’t develop enough (we had to have multiple ultrasounds to confirm his growth was on track). Not the best thing in the moment. I remember crying and wondering if my baby would ever come out of my body. I knew I wasn’t putting my full, total effort into the pushes. I needed to kick it up a notch and just keep going. When he finally emerged, I didn’t even realize he had come out. 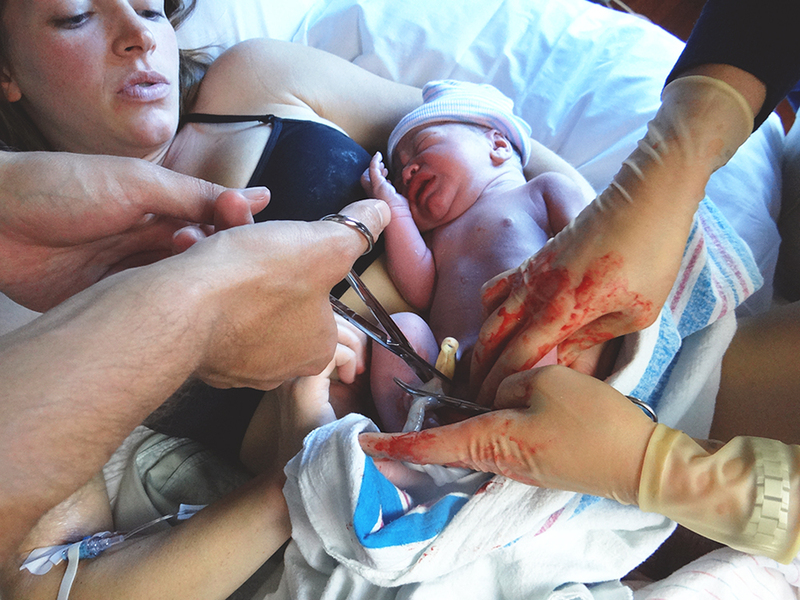 All I knew was that after an hour of pushing, my sweet son’s body came right out with his head and he was being placed into my outstretched arms. I had imagined this moment so many times—the first time seeing his face and how much hair he had and how big (or small!) he was—and now here was his warm, wrinkly, slippery body resting in my arms as he screamed with all his might. Such a surreal moment. His umbilical cord was fairly short, so he rested down low on my chest. It took several minutes to calm him down—knowing him now, I’m sure he was angry because he was freezing! Candice and the nurses wiped him off, put a hat on his head and wrapped him up as he lay on me. His face was sooo smooshy, and his hands and feet were HUGE! Once the cord stopped pulsating, they clamped it and had Luke cut it. I think we were both somewhat in shock that our boy was finally with us. We had done it. All in all, I was in labor for about 24 hours, but it felt much quicker. The hour after his birth was bliss. He just laid on me and I smelled his sweet newborn smell and we marveled at what had just taken place. 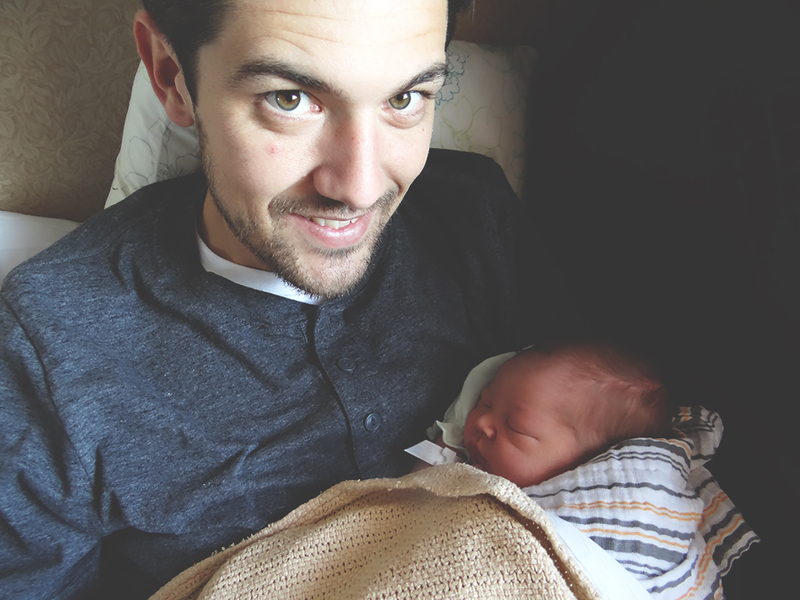 When it was time to feed him for the first time, he latched on like a little fish. I was completely blown away. That night, I couldn't bear to put him down—I don’t think I slept for more than 45 minutes because all I wanted to do was stare at his beautiful face. Those first 48 hours of his life he never once left our sight. Cliff, how could I put into words the way it felt to welcome you into our lives? You are our greatest gift. We’ve known what a good guy you are even from the womb, and you proved that with your wonderful and gentle entrance into the world. We rejoice over you, our sweet Clifford Zeb. You are fiercely loved.